This adventure has to be the most fulfilling experience of my life. In June this year, I returned to Baltoro/Concordia region of the Karakoram range, home to four of the 14 8,000 metre peaks in the world. On my last trip in 2016, I visited the K2 and Broad Peak Base Camps and returned from the same route via Askole. But this time I planned to cross the elusive Gondogoro La and return via Hushe Valley, completing a circular trek. I had heard so many stories about Gondogoro La and it was time to experience it for myself. La in Balti means mountain pass, ridge or a low point between two mountains, allowing access through a relatively lower point. 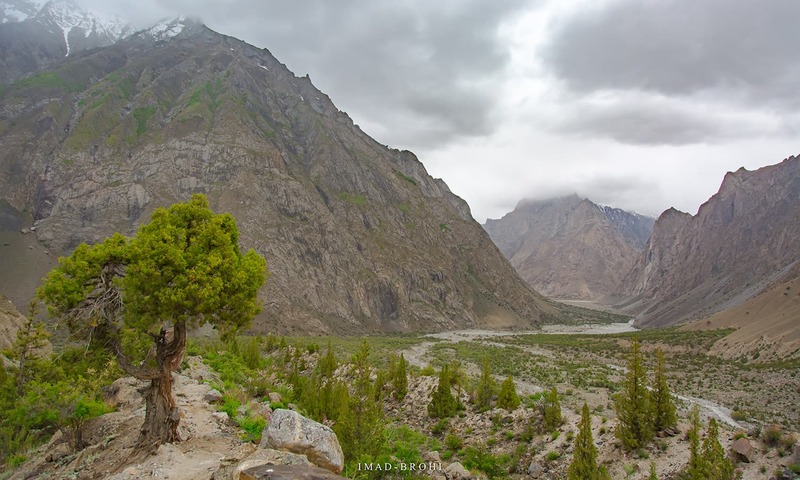 Gondogoro La connects Baltoro region with Hushe Valley, home to the exquisite Laila Peak (6,096m) and some small villages like Hushe and Kanday. However, the pass is very steep and crossing it requires the use of fixed ropes to ascend and descend. So in a way, this is beyond conventional trekking. 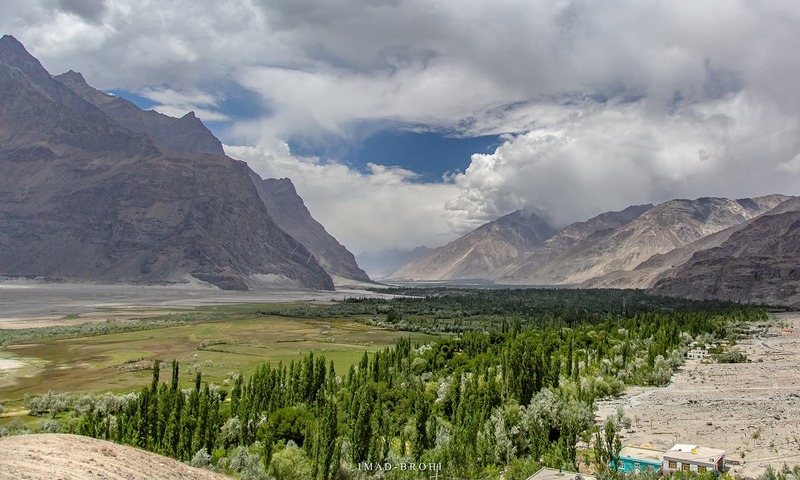 Passing the town of Shigar, 45 minutes from Skardu. You know you have reached Askole when all of a sudden, the barren route turns green. 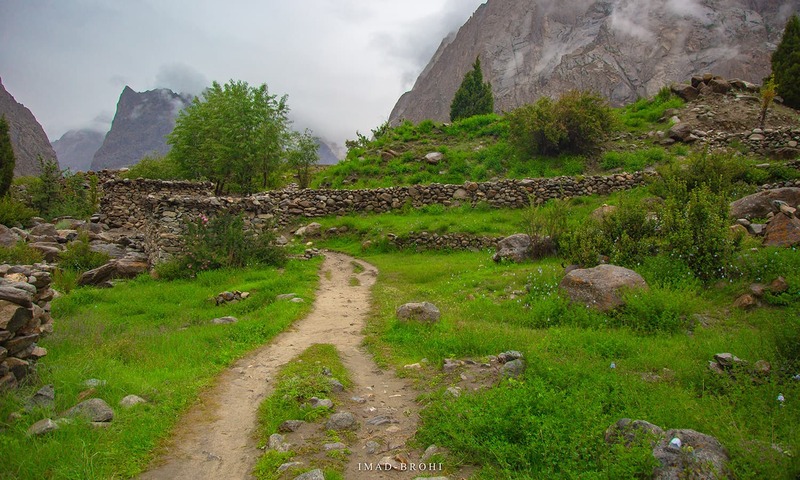 Askole is a small farming community and doorstep to the giants of Karakoram. At the beginning of every season, a rescue team from Hushe village takes up the task of fixing these ropes, maintaining them through the trekking season and removing them at the end of the season in late August. 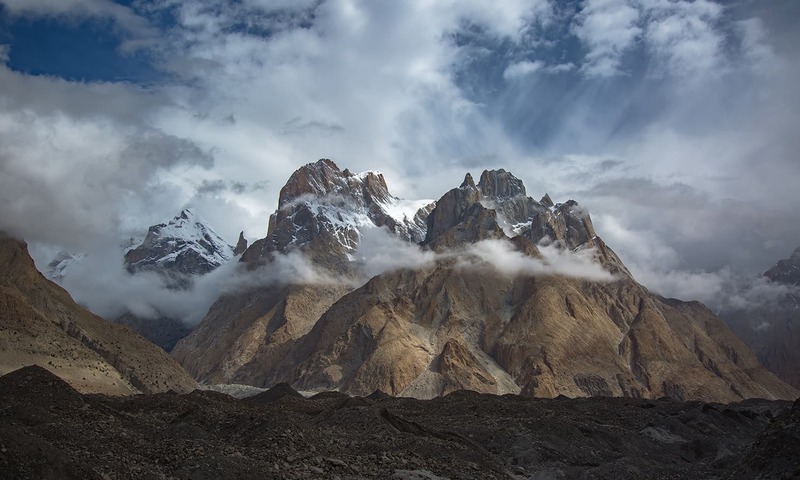 They establish their presence on each side of the pass — Ali Camp on the Baltoro side and Khuspang on the Hushe side — and charge a nominal fee from trekkers crossing the pass for their services, which is a fair deal. To cross this pass at any other time of the year, teams would require services of High Altitude Porters (HAPs) who would fix these lines allowing them to make the crossing. I started planning a few months before the trip. I had been to Baltoro before, so I knew what to expect — but my biggest question was when the ropes would get fixed. I was hoping to reach Ali Camp on June 23 and be ready for the crossing. But if the ropes were not fixed by then, there was no point in making the trip. 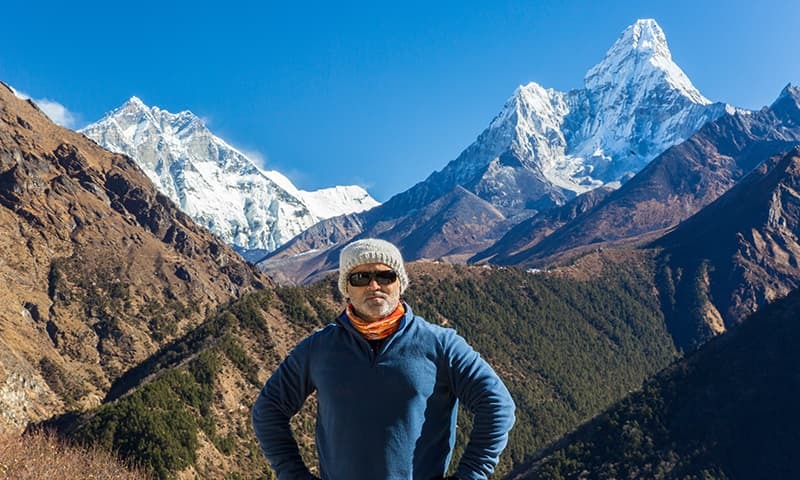 I contacted nearly half a dozen trekking companies to find out. While some assured that the ropes should be fixed by then, others were skeptical. 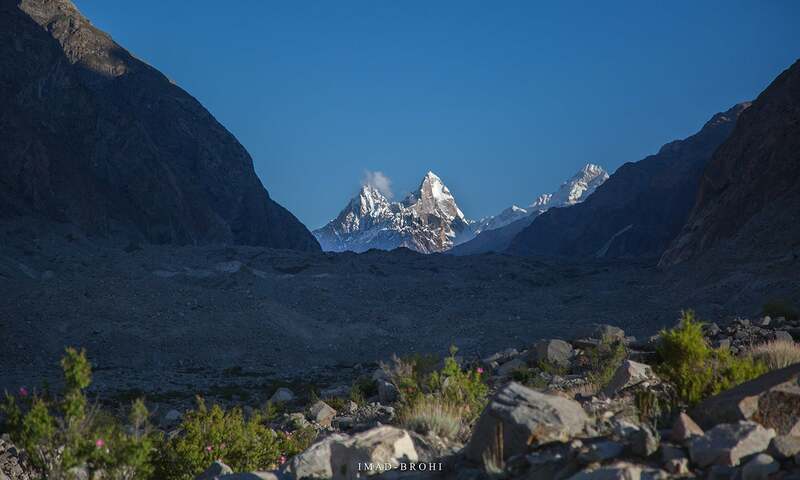 Uzun Brakk (6,375m) that lies on Biafo Glacier can be viewed near Khorofon, midway between Askole and Jhola. Route to Snow Lake turns north from here towards Biafo Glacier. 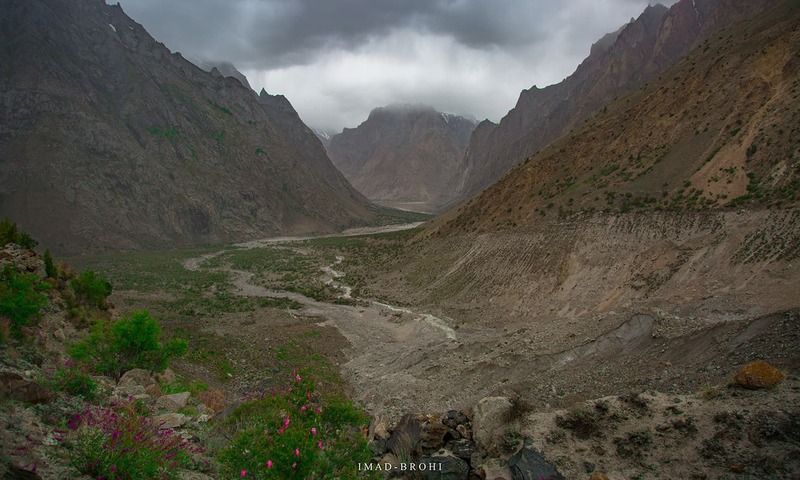 The valley opens up and the flow of Braldu River slows down before Jhola. Guide Fida Mohammad poses at a trail cut through mountain rock. 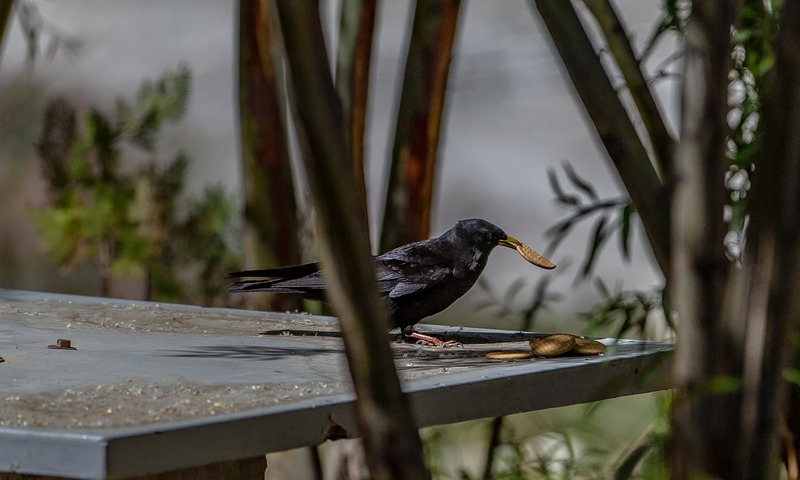 A crow steals my snack at Jhola. 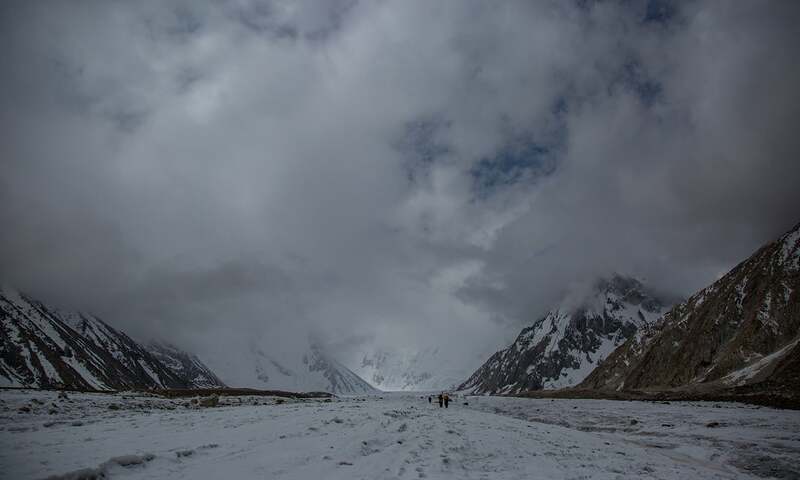 The answer finally came from Manzoor Ahmed of Karakoram Tours Pakistan who informed me that the rescue team had met in Hushe and planned to fix the ropes immediately after Eid (mid-June). 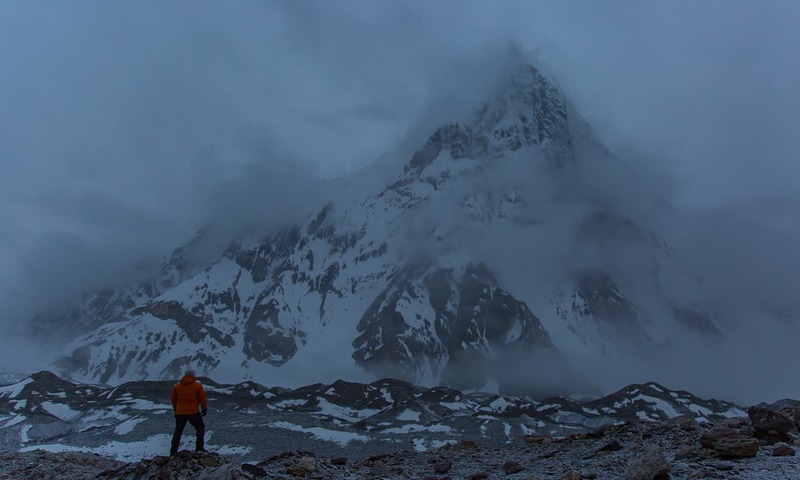 Ahmed had a climbing expedition headed over to Broad Peak on a similar date and offered me to join them until Concordia, after which I would separate from the group and head over to Ali Camp and make the crossing with a smaller team, including a guide and a few porters. It seemed a good deal to me — a smaller group had higher chances of crossing the pass than a larger one. Most local or international expedition teams intending to visit the Karakoram in Pakistan begin by arriving in Islamabad. The second stop is Skardu, where I stayed at the Pakistan Tourism Development Corporation’s K2 Motel and met the Broad Peak expedition team. The motel was hustling with many international climbing and trekking expedition teams. On June 16, we made the scenic but tiring 125km road trip from Skardu to Askole that takes more than five hours due to difficult terrain. First views of the Trango Group. The highest summit is 6,286m and these granite spires present one of the most challenging climbs in the world. 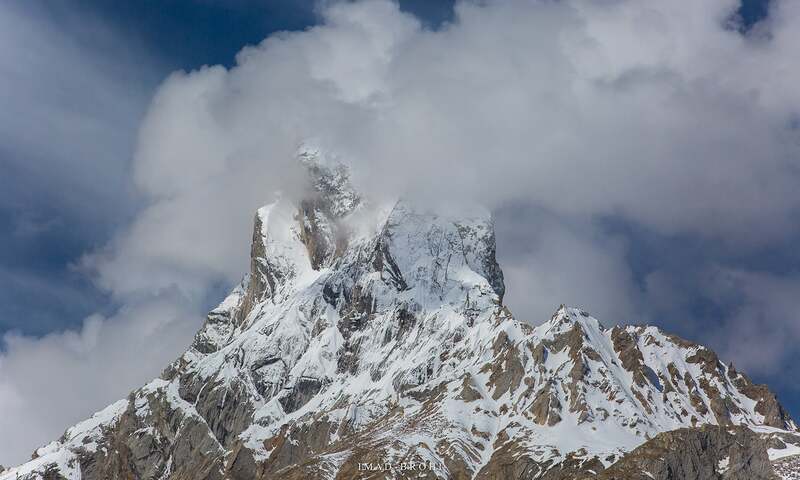 The jagged peak of Bakhordas (5,809m). Views of the giants from Payu: Trango and Cathedral groups. The snout of Baltoro Glacier just before we step on it. The glacier feeds the Braldu River. After a night in Askole, we began trekking to our first destination, Jhola, a distance of 18km. It was a nice trek with varying views and proper trail for the most part on the first day. 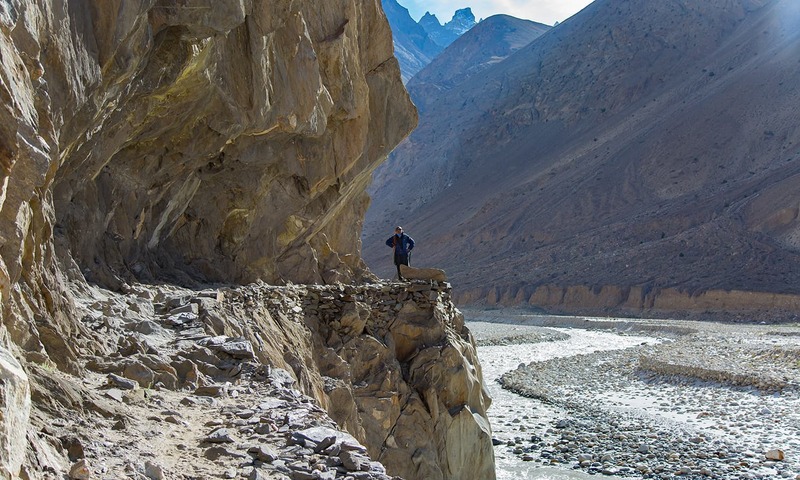 My favourite place was a few kilometres before Jhola camp, where the trail cut through mountain rock. There were also some interesting bridges to cross on this day. 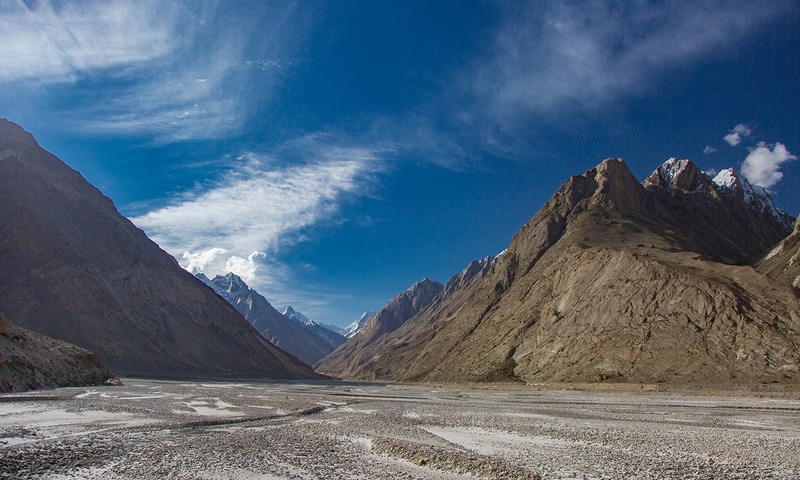 From Jhola camp, one could enjoy the view of Bakhordas mountain (5,809m) just across the river. Payu was the second destination of the trek. This day, for the most part, featured an uneven trail and some streams and just before Payu was an extremely tiring rocky patch. 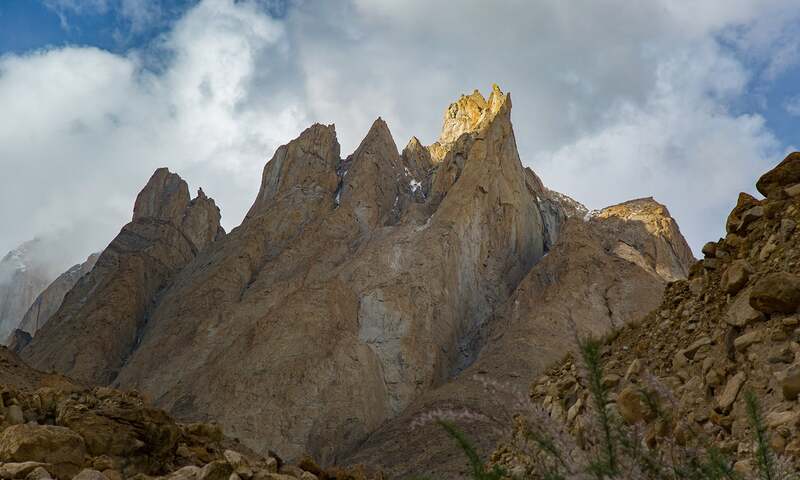 Payu Peak became visible as we neared the camp and in the far distance were the first views of the Trango Towers, a set of three near-vertical rock towers, and Cathedral Peak, also known as Passu Cones. Trek distance was roughly 20km. A rest day at Payu was much needed and important for acclimatisation, as we were now at 3,400m. That day, Ahmed called me on the team's satellite phone to let me know that ropes had been fixed on Gondogoro La. After Payu was where the real fun began. I finally stepped on the mighty Baltoro Glacier. At more than 60km long, it is one of the longest glaciers in the world outside the polar regions. 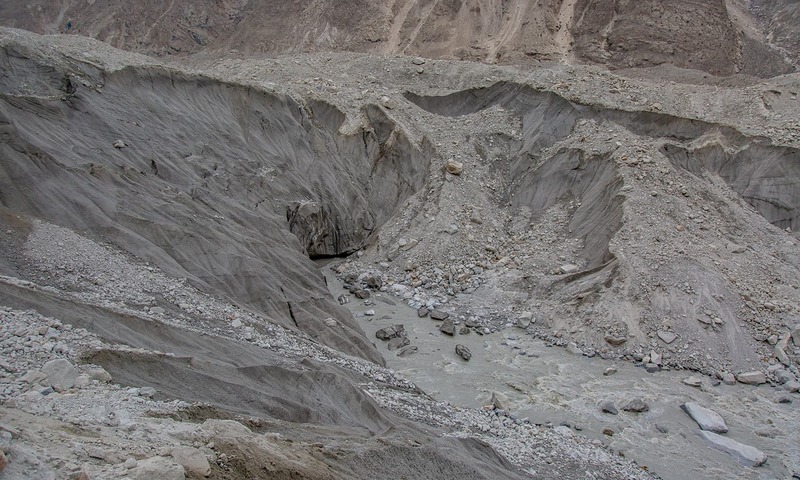 It is also the source of Braldu River that connects with Shigar River. Our destination was Urdukas, some 20km from Payu. Few kilometres on the glacier and the views of the Trango and Cathedral Groups improved greatly. summit rocks of Trango Group. Summit rocks of Cathedral Group. 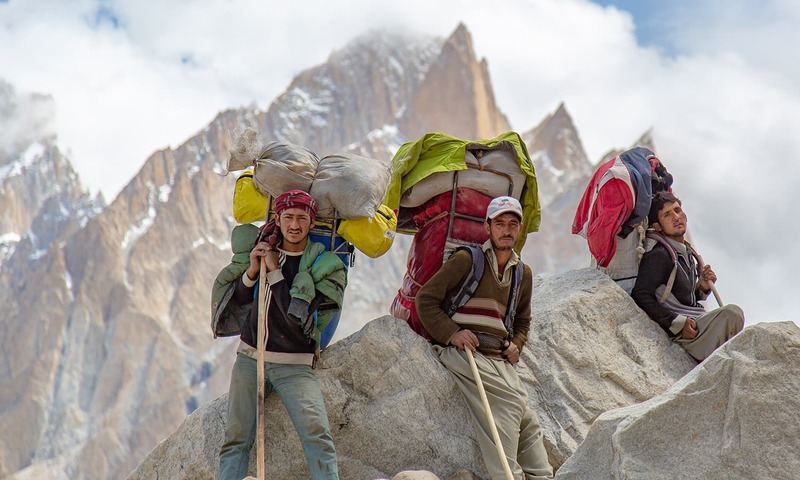 The true heroes of Karakoram. Trekking or climbing would not be possible without their efforts. The stream crossing before Khoburshe. Panoramic view from Urdukas at night. 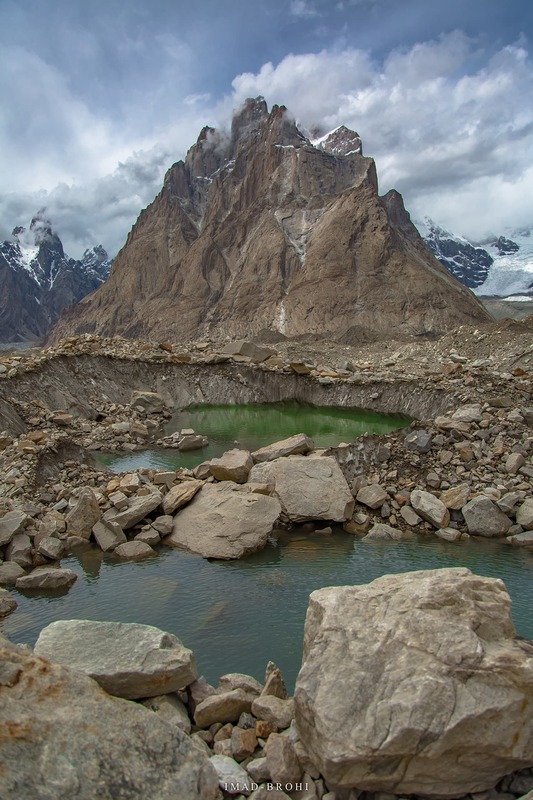 A glacial pond in front of Great Trango. One could only wonder what forces caused such massive mountains to form, each unique in its own way. I also experienced Liligo Glacier intimately. Along the route were two smaller camps: Liligo ( which doesn't get water until July) and Khoburshe (where I stayed in 2016). 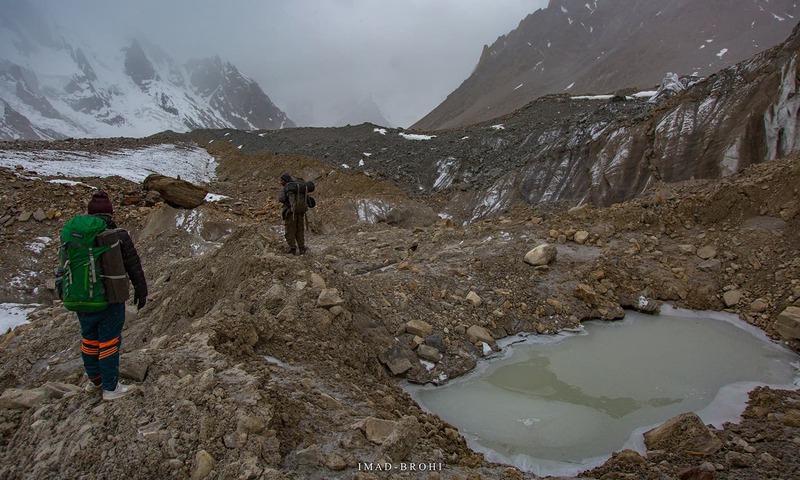 A glacial lake had formed just before Khoburshe, which seemed smaller this year than in 2016, an example of how these glaciers are constantly changing. There was a tricky stream to cross before Khoburshe. From there, Urdukas was another 6km, but there was a section of big boulders to cross and a climb that made it very tiring. 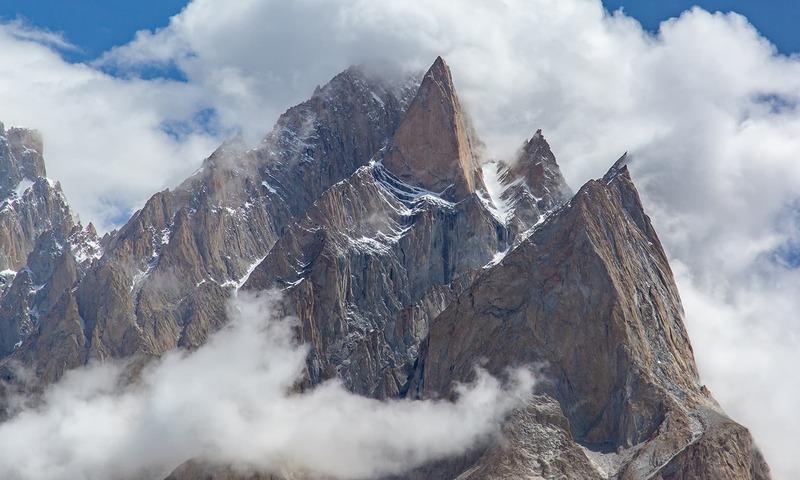 Urdukas is located off the glacier on a hill and had great views of Uli Biaho, Trango Group and Thunmo Cathedral. 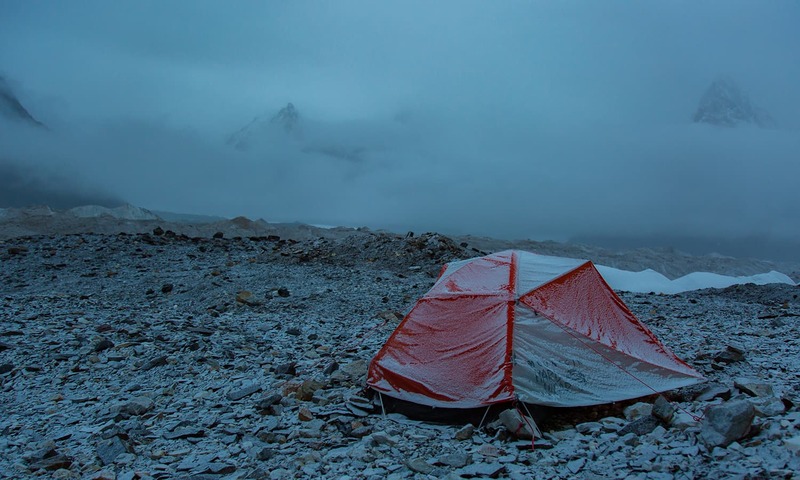 The next destination was Goro II, the first camp of the trek actually located on the glacier. From Urdukas it took us almost two hours to get on the glacier. A lake had formed, washing away the first section of the trek used in previous years. 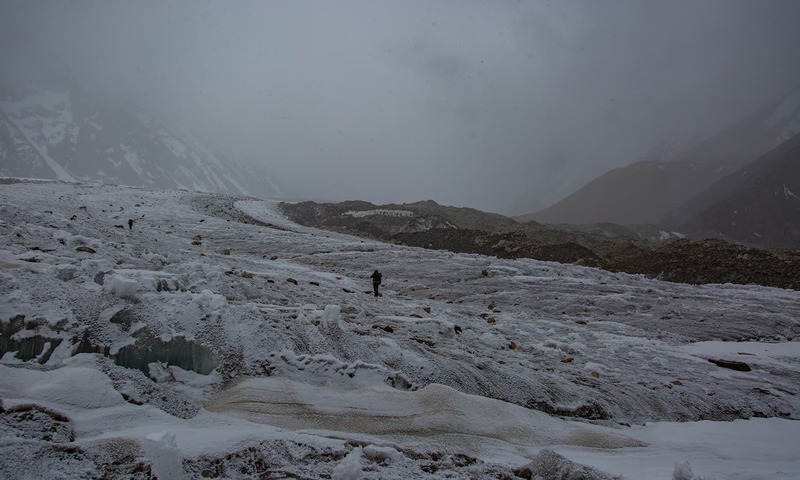 Several porters that were ahead of us had to turn back and we finally found a detour to get us on the glacier trek. Once on the glacier, the ascent was gradual in humps, several ups and downs. A small campsite, Goro I, was where we had a quick stop for lunch and in the next 90 minutes, we reached Goro II. 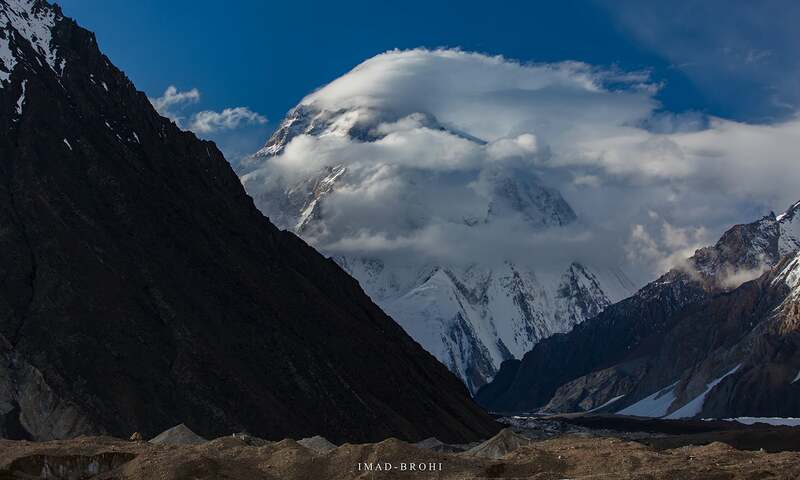 Goro II is located just by a wide mountain called Biarchedi (6,781m) and has views of the world’s 22nd highest mountain Masherbrum (7,821m), also called K1 for Karakoram 1. 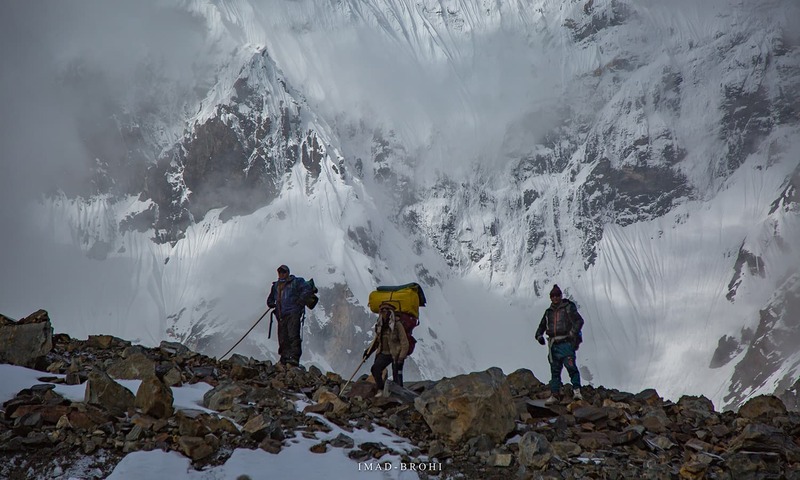 Climbers and porters try to find the trail after Urdukas with Lungka Group (6,250m) in the background. 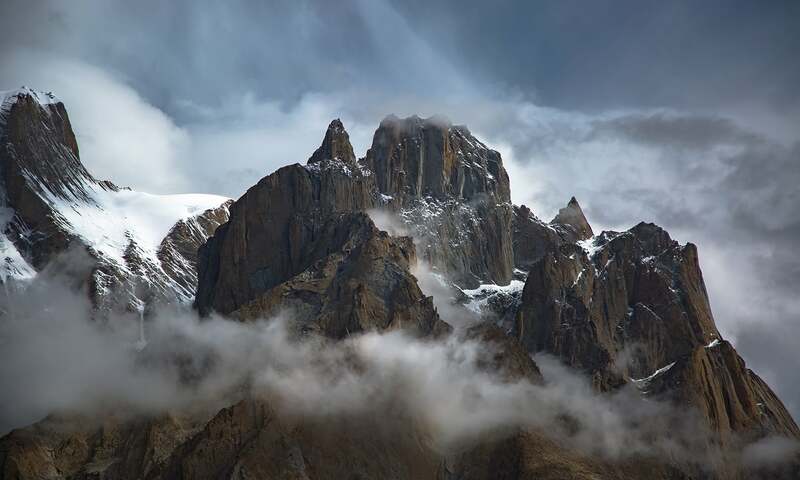 The Trango Group peeks from behind the clouds. Several lakes had formed on the melting glacier. The labyrinth of crevasses on Baltoro. Biarchedi (6,781m) from Goro II. Leaving Goro II after snowfall. 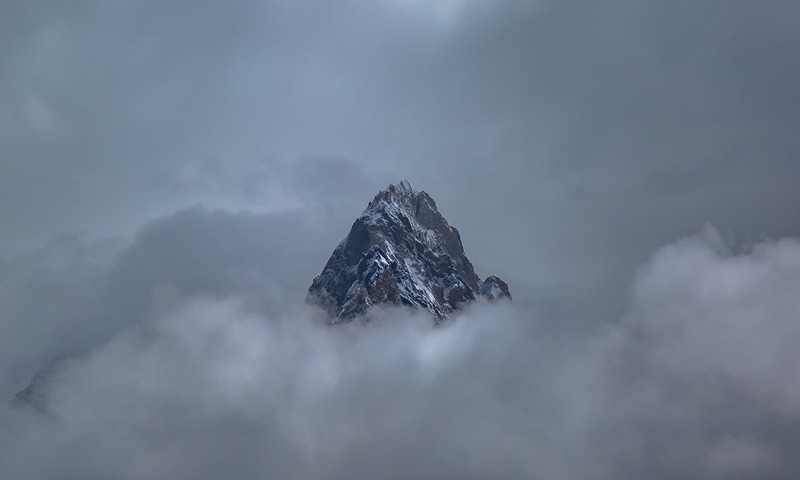 Unlike K2 and its surrounding giant peaks, Masherbrum is visible from several places and before the Karakoram range was explored, it was thought as the highest mountain in this range, thus the name K1. It was a clear night in Goro II and the moonlit mountains looked stunningly beautiful. Masherbrum stood mysteriously at a distance, looking like a shadow. While taking night shots, I heard a loud thunder and noticed a huge avalanche coming down the slopes of Biarchedi. After a few minutes, the avalanche had settled and the night became silent again. The weather so far had looked troubling. While nights had remained clear, the days were cloudy with intervals of showers. 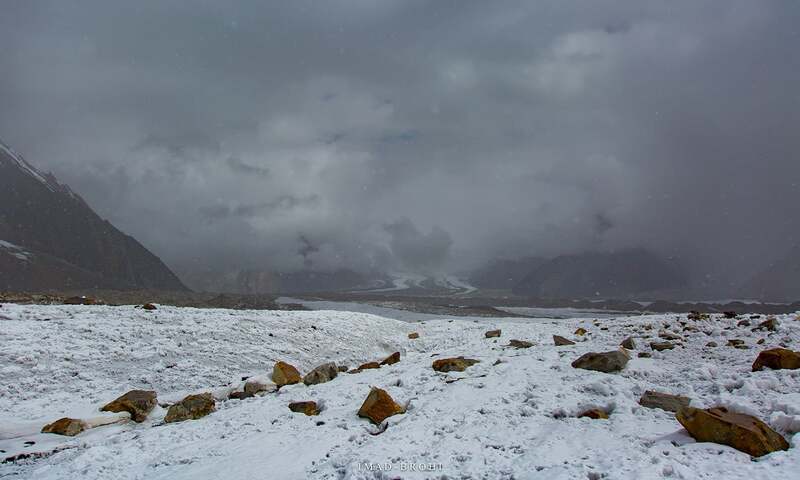 In my conversations with our guide Fida Mohammad, he was unsure if Gondogoro La could be crossed in this weather. Earlier that night at Goro II, I called expedition lead Mehdi Ahmed to discuss my chances of crossing the pass. Mehdi invited a HAP, Ali Janua, into the discussion. Ali was a K2 and Broad Peak summiteer and knew Gondogoro La by heart. He advised us that despite cloudy weather, crossing the pass was definitely possible as long as there was no storm. Waking up the next morning was heartbreaking. The clear skies were gone and there was snow everywhere. 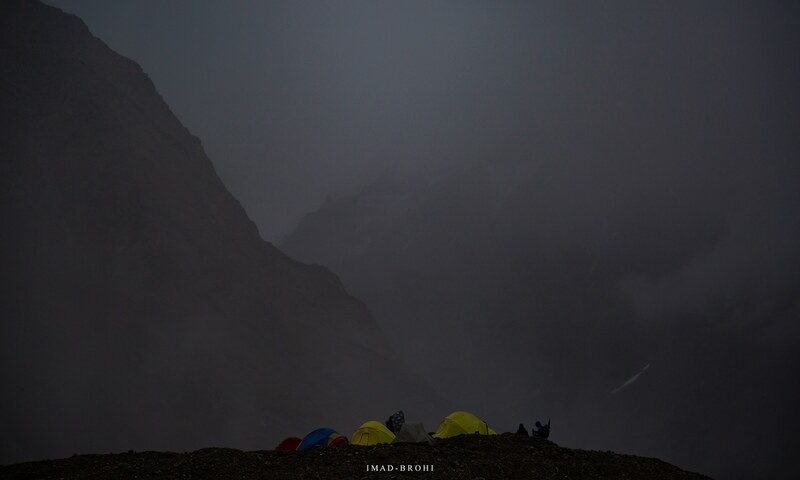 In the 10km from Goro II to Concordia, the weather was overcast throughout the day and we met at least three groups that had intended to cross Gondogoro La turning back, claiming that the pass was closed because of bad weather. 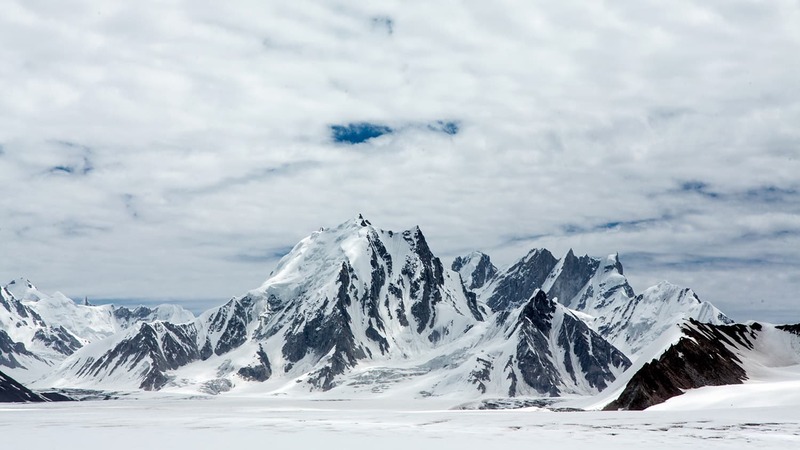 Concordia is the junction where Baltoro Glacier meets Godwin-Austin Glacier and the central point for those visiting K2, Broad Peak, Gasherbrum I, Gasherbrum II and many other base camps. 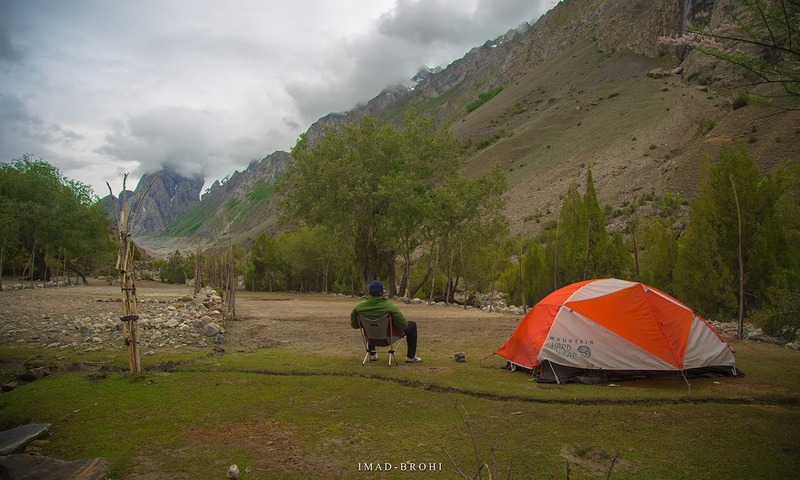 The campsite sits strategically between Marble and Mitre Peaks and in front of the Gasherbrum Range. The Concordia panorama. Left to right: K2 (8,611m, hidden in clouds), Broad Peak (8,051m), G4 (7,925m). Heavy winds blow on K2. Broad Peak (8,051m), the world's 12th highest mountain. Marble Peak (6,256m) sits next to Concordia. Worlds 17th highest mountain, Gasherbrum-4 or G4 (7,932m).. Snow storm returns to Concordia in the evening. 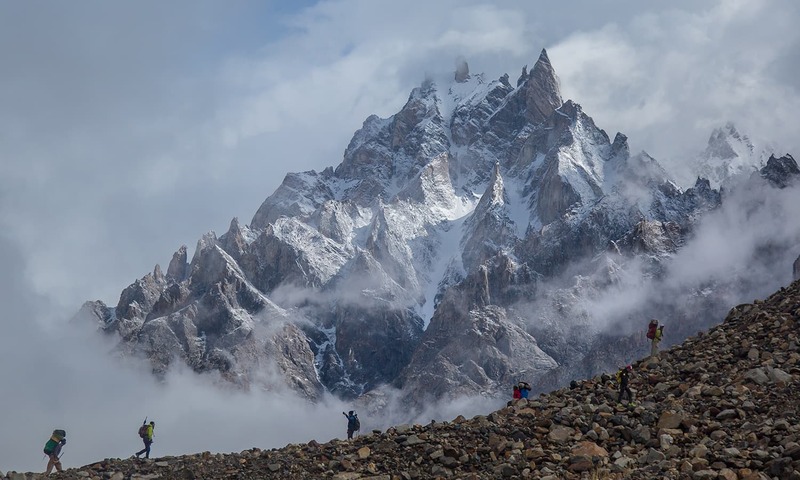 From Concordia, the route to K2 and Broad Peak Base Camps heads up north on Godwin-Austin Glacier, while the G1/G2 Base Camps and Ali Camp/Gondogoro La heads south on Upper Baltoro Glacier, eventually connecting with Vigne Glacier. 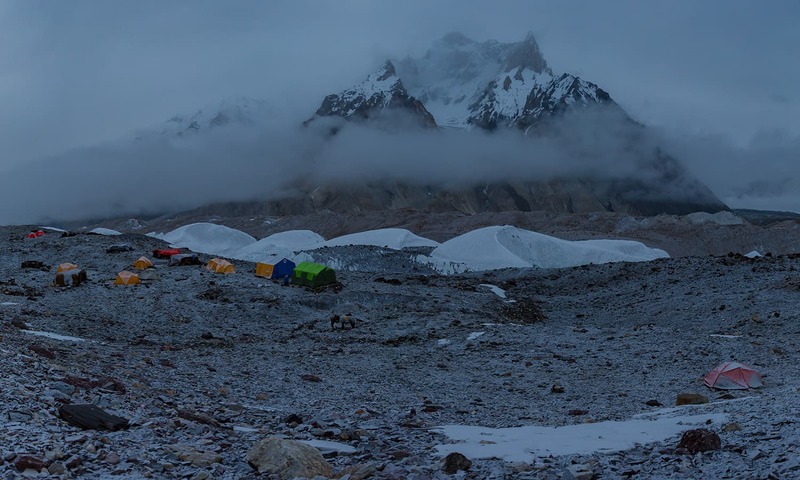 At Concordia, most of our expedition proceeded to Broad Peak Base Camp with the climbing team. We spent a day at Concordia for weather to clear up and although it did stop snowing, the sky stayed cloudy for the most part. Here we decided to return all porters except one, along with any extra items including food, clothing, kitchen tent and utensils, back to Askole. Limiting weights and team members increased our chances of making the crossing successfully. Trying to view Mitre Peak (6,010m) in the storm. The Concordia camp with Marble Peak (6,256m). Campers prepare to sleep as night settles. A peak through the clouds during the storm. The team we selected to cross Gondogoro La included myself, our guide, porter Ghulam Mehdi (affectionately called Ali Cho), expedition lead Mehdi Ahmed (who joined us from the Broad Peak expedition just to cross Gondogoro La) and probably the most important member, 30-year-old Mohammed Ibrahim. 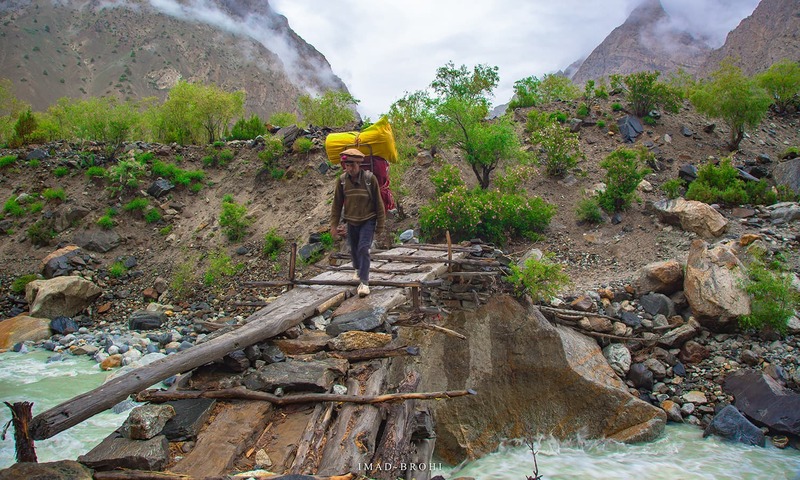 Ibrahim was a high altitude cook and porter from Kanday, a small village 6km south of Hushe. He had made several crossings across Gondogoro La, many times without the use of fixed ropes. Legend goes that he once climbed Camp 3 of Broad Peak for a rescue mission wearing running shoes. We began our march to Ali Camp the next morning and ours was the first group to reach the camp in the 2018 season. There was an Italian group at Concordia that planned to cross the Gondogoro La but they were unsure of proceeding. Unlike us, they had a big group: eight trekkers and tens of porters. They stared at us in wonder when we told them we were heading over to Ali Camp despite the weather. 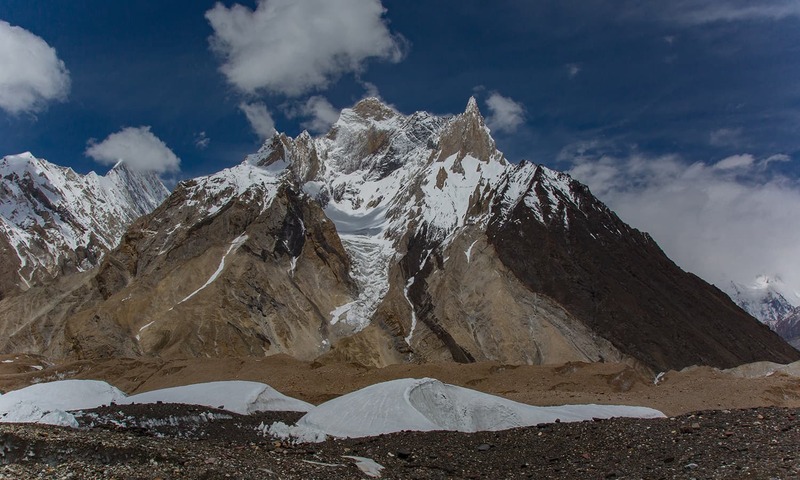 It took us an hour to pass some crevasses near Concordia and find the route on the Upper Baltoro Glacier, which would take us round the Mitre Peak through Vigne Glacier and to Ali Camp. The team crosses the crevasse safely. Trekking on the Upper Baltoro Glacier. Looking back towards Concordia from Upper Baltoro Glacier. On a clear day we would have had an excellent view of K2. Another glacial pond on the Upper Baltoro Glacier. Trekking on the Vigne Glacier. Ali Camp panorama. 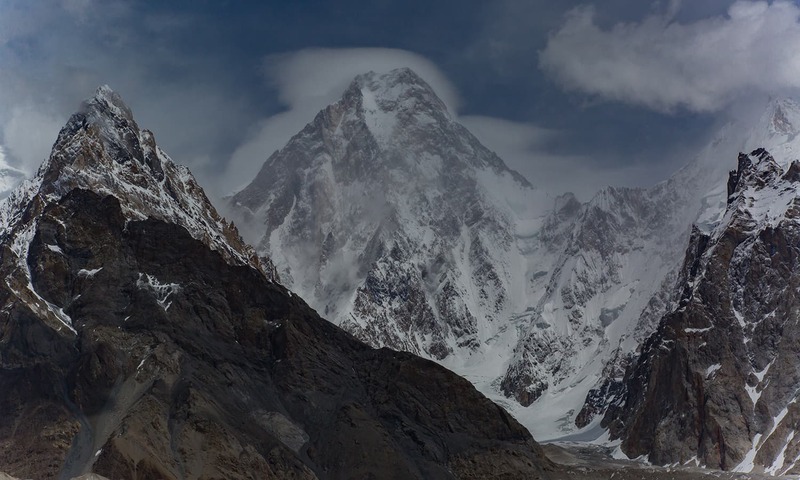 Left to right: Broad Peak (8,051m), G6 (6,979m), Chogolisa (7,665m) and Tasa Brakka (6,700m). The Chogolisa Group (7,665m). 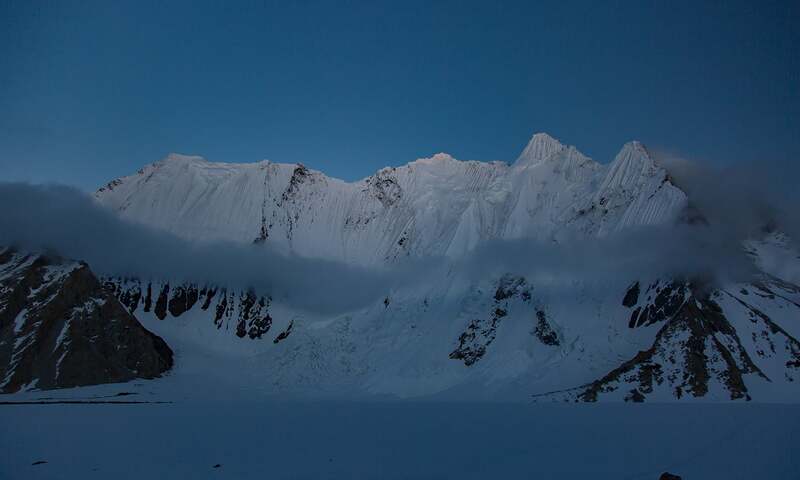 Chogolisa’s main peak is the 36th highest mountain in the world. The renowned Austrian mountaineer Hermann Buhl, first to climb Nanga Parbat as well as Broad Peak, died on Chogolisa in June 1957. His body has never been found. Ali Camp panorama at sunset. 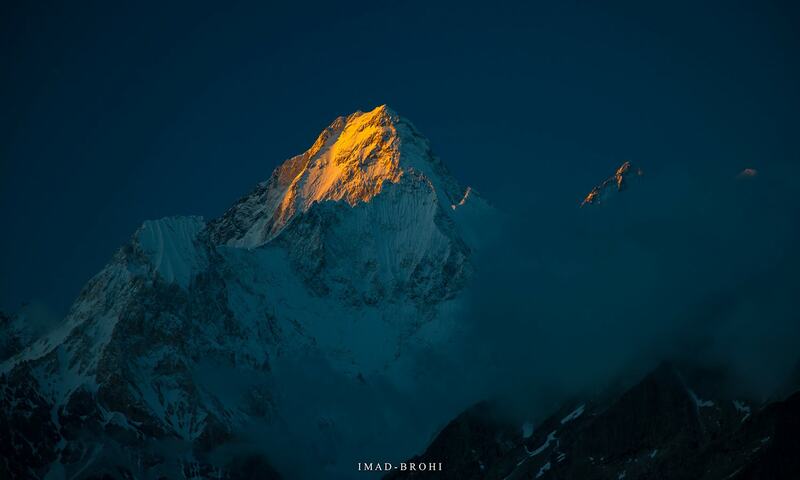 Last light of the day on G6 (6,979m). The day was mostly overcast and it started snowing around afternoon when we were just 30 mins from Ali Camp. At that point, we noticed that the Italians were also following us. For the final 20 minutes, the five of us roped up for safety and reached Ali Camp around 2pm. The Italians arrived shortly after. That evening, the clouds cleared up completely and all the peaks were visible. 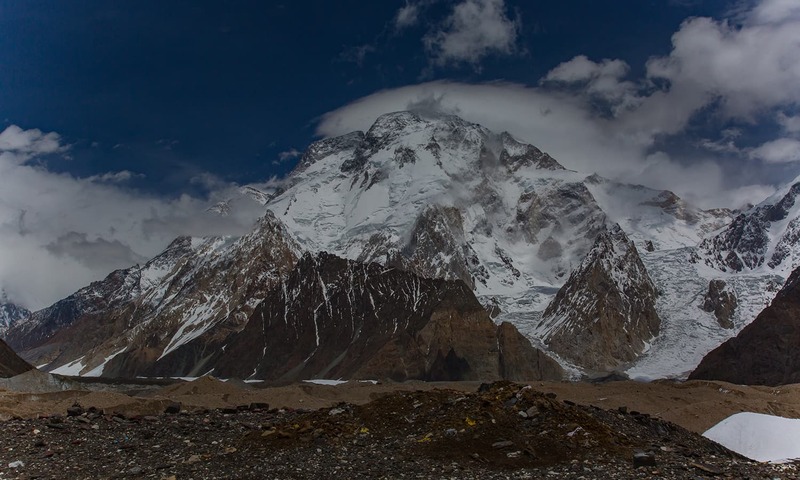 The Ali Camp panorama was stunning with views of Broad Peak, G6 (6,979m), the beautiful Chogolisa (7,665m) and Tasa Brakka (6,700m). We had a good window to cross the Gondogoro La that night so we all went to bed rather early. Our team woke up at midnight to climb Gondogoro La. It is absolutely necessary to cross the pass before sunrise to avoid any risk of avalanches and ice falls due to rise in temperature. It was a cold, overcast night but it wasn't snowing. This time, we decided to stick just behind the Italians as there was a lot of snow on the ground and we wanted them to break the trail for us. Of course, we did not tell them that. The first hour was a gentle ascent, after which the terrain was mostly flat. Often, our feet would sink knee-deep into the snow. 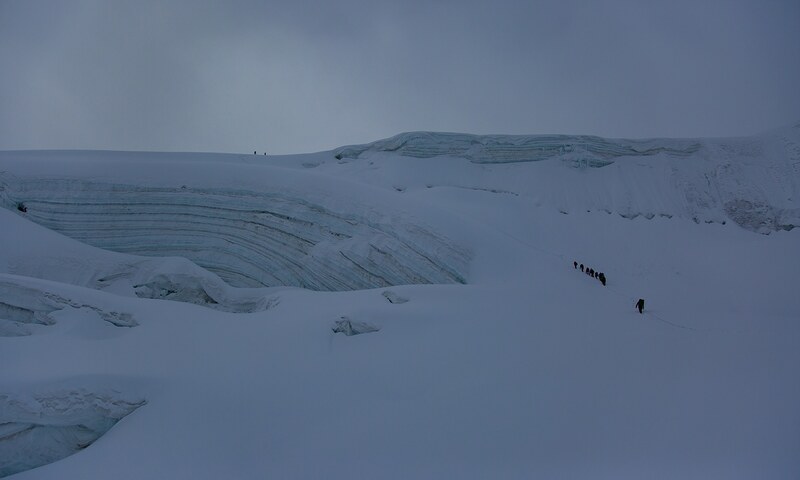 Members of the rescue team kept a close watch on the teams crossing from the summit of Gondogoro La. The Gondogoro Glacier on the Hushe side of Gondogoro La. One of the most beautiful mountains in the world, Laila Peak (6,096m) from Khuspang. Climbing route is from behind the peak and popular descent is to ski down. After a slog of about two hours, we reached a very steep section with fixed ropes. Here, we attached our safety carabiners to the ropes and started ascending slowly, holding the ropes. Incredible ice walls and seracs were hanging over us and this was no place to stop. We kept moving slowly and gently while maintaining a safe distance from the Italians. Finally, after about another two hours, the fixed ropes ended and the terrain became flat again. I knew then that I was on top of Gondogoro La. Oh, what a feeling. On a clear day, we would have enjoyed views of K2, Broad Peak, G1, G2, Laila Peak and Hushe Valley — probably the most impressive mountain scenery in the world. We spent around 10 minutes at the top, taking a summit photo with the Italians and immediately starting the descent over on the Hushe side. It's a steep way down, to be made while holding the fixed ropes. 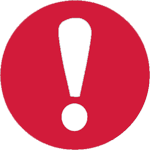 There are two sections with avalanche danger but they are short and can be crossed quickly. It took us another two hours to descend. Throughout this crossing, we ran into several members of the Rescue Team who were there to ensure the safe crossing by all members. One rescue team member, Danial, stayed with us all the way till the end of ropes. Once at the bottom on the Hushe side, it was a nice and gentle trek to the campsite of Khuspang. The view from Khuspang was beautiful, with views of Laila Peak, one of the most beautiful mountains in the world, standing proud on the other side. This was a nice day to enjoy with the summit behind us now. 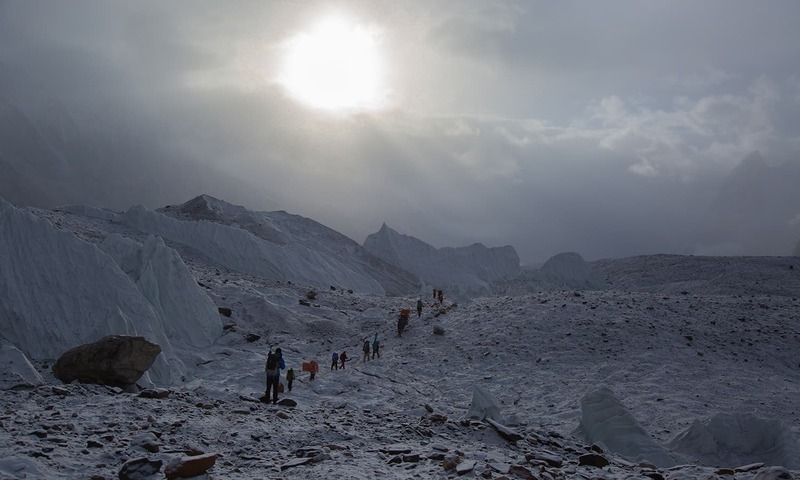 Our first two hours were on the glacier trying to get to Laila Peak Base Camp. There was one tricky crevasse section to be crossed just after Khuspang but after that, the remaining glacier crossing was rather simple. 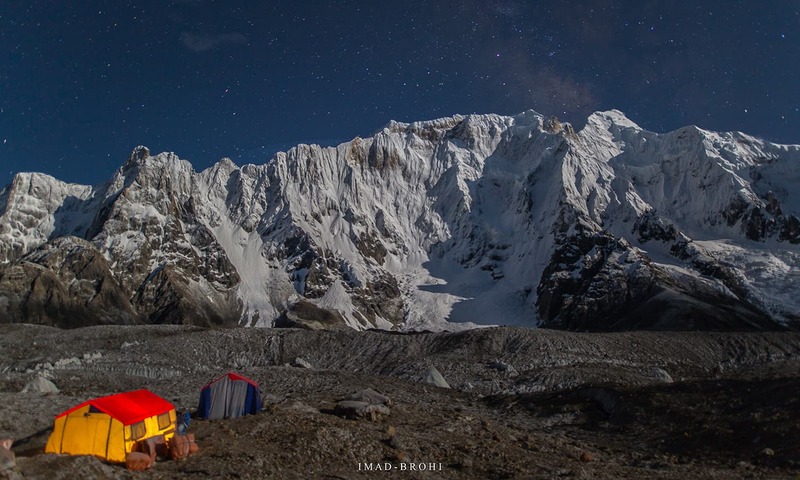 Laila Peak Base Camp sits in a beautiful green valley and had an excellent view of Masherbrum Glacier. Trying to find a way back on Gondogoro Glacier through the crevasses. A porter views the mighty Masherbrum Glacier in awe. 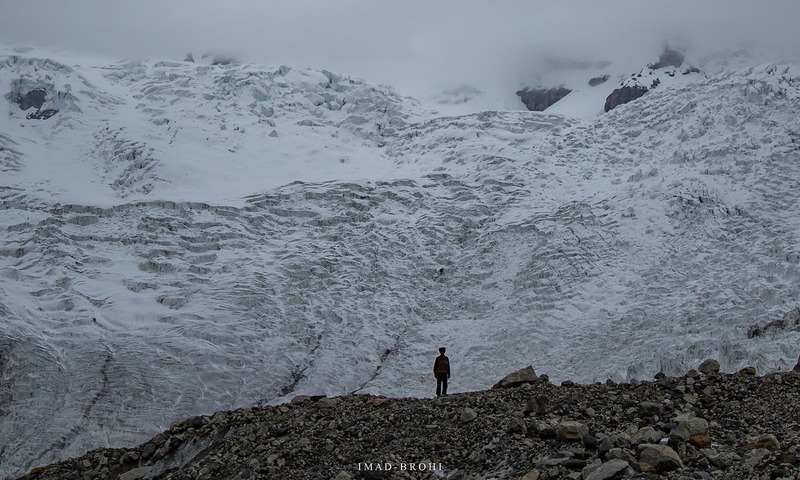 A tough trek full of crevasses crosses this glacier to reach Goro I. Soon after, Hushe Valley opens up and shows us its full grandeur. You know you are in Shaiescho when you hear the gushing Hushe River that runs next to it. On a clear day, we would have seen Masherbrum Peak from the Hushe side. The beautiful flowers and fauna of Hushe Valley made us feel fresh and energised. After Laila Peak Base Camp, a nice trek took us to Shaiescho, a very green campsite just by Hushe River. There is one very tricky rocky section to be crossed just after Laila Peak Base Camp that requires scrambling. Ropes and hooks were put in that section last year by a Swiss organisation but the equipment was missing this year. This was the last day of the trek following Hushe River along the greens. The entire day was overcast and it kept drizzling along the way. We took nearly three hours to trek 10km. Just before Hushe, we walked through a beautiful wheat and potato farm. At Hushe, we signed off with local police and Central Karakoram National Park officials, where we were told that we were the first group to complete Gondogoro La circuit this year. I finally rested at Shaiescho, having completed Gondogoro La Circuit (well, almost). Porter Ali Cho on the bridge. Most of the Shaiescho to Hushe trek was on a nice, flat trail. The trek passed through several structures built to keep goats and cows. A vehicle was waiting for us which took us to Kanday, just 6km from Hushe, where we had lunch at Ibrahim's house. 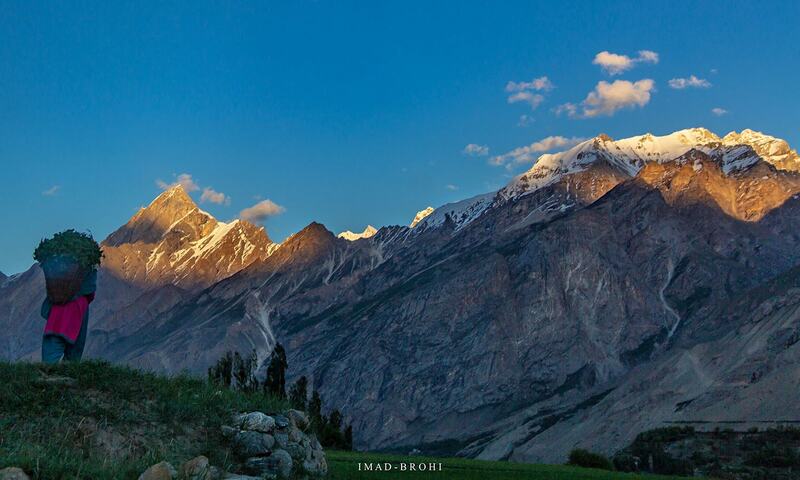 The journey from Kanday to Skardu took five hours and we reached Skardu around 5pm. I couldn’t wait to get my first shower after almost two weeks. 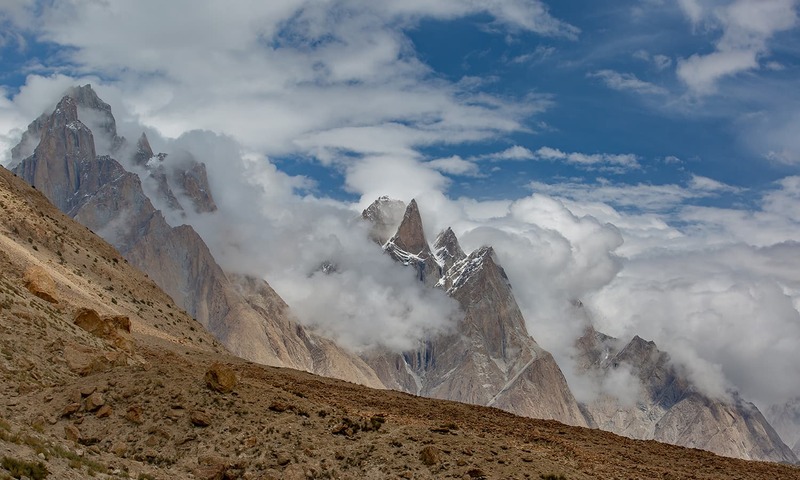 The Baltoro/Gondogoro La Circuit has to be one of the richest trekking experiences in the world. 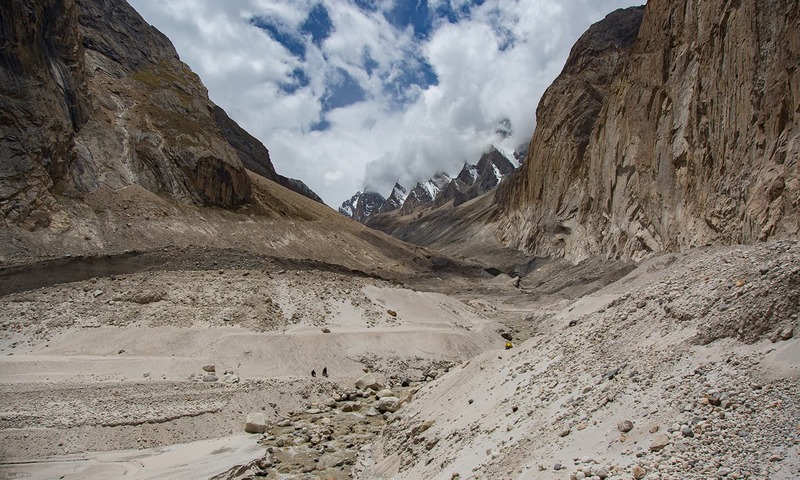 The trek goes through the fields of Askole, moraines of Baltoro, the raw Baltoro Glacier, the much different Vigne Glacier, then crosses a high pass into the green, alpine environment of Hushe. It is a very strenuous trek, though. Lack of proper trail on the glacier, stepping on gravel and stones make it extremely difficult. 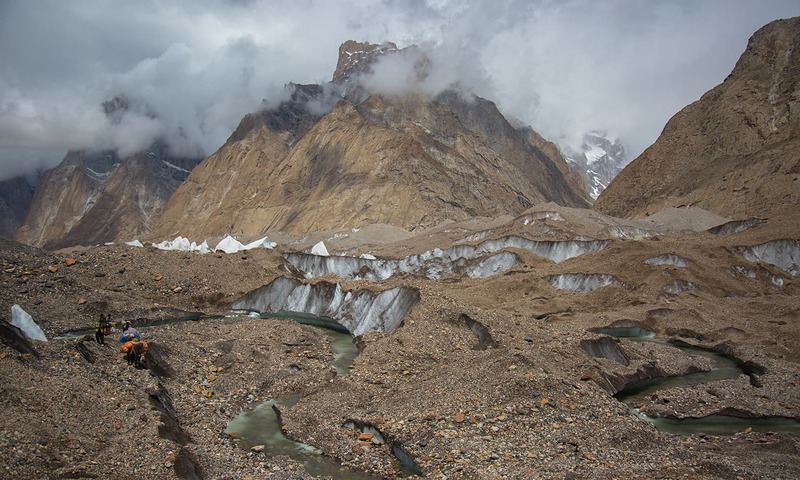 The beauty on the Baltoro side is raw and dramatic: the melting glacier, Trangos, K2 and Broad Peak. 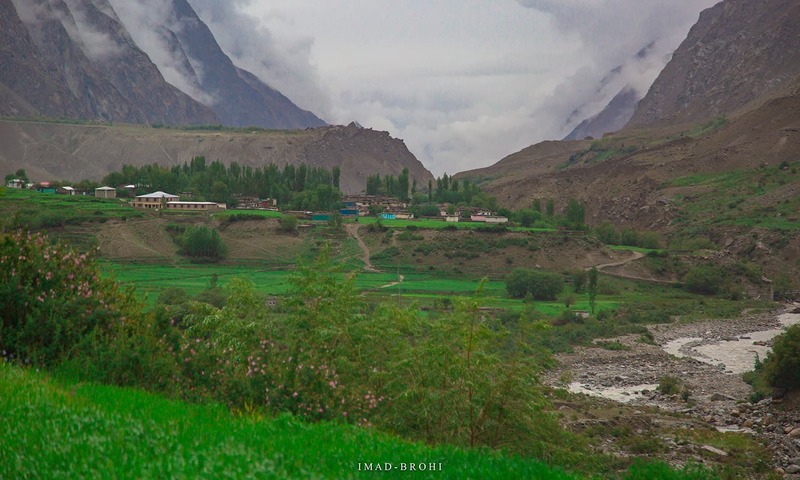 On the other side, Hushe Valley is greener and mellow: the flora, fauna and the Laila Peak. This combination is what makes it a truly remarkable experience. While crossing Gondogoro La is difficult and dangerous to some extent, preparing for the crossing and adhering to the advice of the rescue team on the mountain will greatly increase your chances of crossing the pass safely. After this trip, I also found a great respect for the people of Hushe and Kanday. They are soft-spoken, extremely helpful, generous and very skilled at climbing. 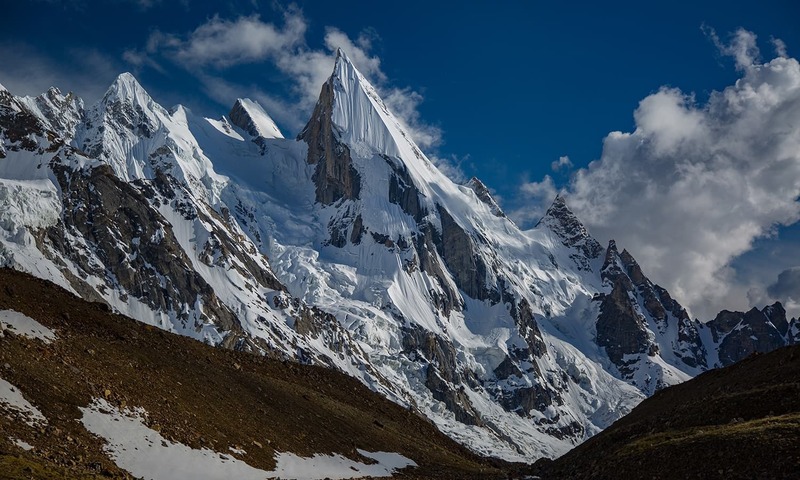 Hushe Valley has produced some of the best climbers from Pakistan, including Hassan Jan. Gondogoro La provides a source of income for this community. Those who have the ability to pass Gondogoro La must do so not just to enrich themselves but also to help the people of Hushe Valley. The Gondogoro La trek is not for families or young children due to its strenuous nature. For families and weaker trekkers, I would recommend driving to Kanday and exploring Nagma Valley and/or Masherbrum Base Camp. Relatively stronger trekkers can also hike up to the steep Iqbal Top from Kanday, from where one can view both K2 and Broad Peak. loving the whole .. you have done an awesome job. This is Pakistan normally hidden from outside world. Breathtaking beauty and very well written article. So majestic. Loved the reading and pictures. Photos are just mesmerising. Great effort. Such a scenic place and all in Pakistan. The article is informative and inspiring... only I could follow the track. 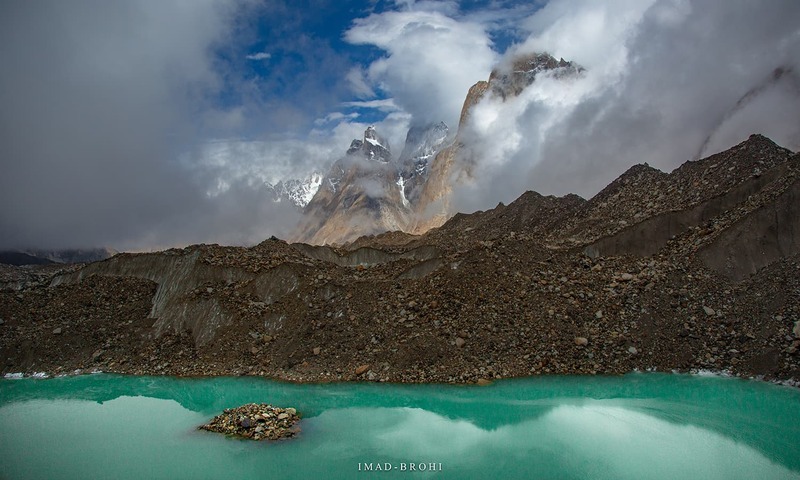 Imad - Great story and beautiful pictures! How many days was the trekking this time? We are aiming to return to Karakorams soon. See you there! Wonderful, Imad and thanks for sharing the beauty God has gifted to us. PK, keep it pristine and share. May God keep you all safe. 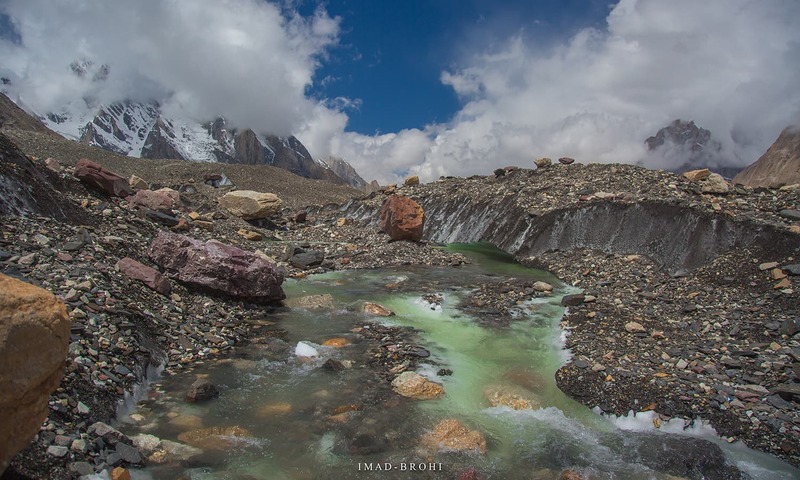 Beautifully written, we took an expedition trip in 2014 to climb Laila Peak. We took the same route you came back and also met Hassan Jan but our HAP was a different Hassan (colleague of Hassan Jan). Our cook was also from Kanday. What a great experience and people I came across but you captured it perfectly. It’s hard to explain the beauty of that area and the people!! Thanks for sharing your amazing adventure. Absolutely love the pictures, they are so dreamy. What a beautiful place and what an amazing coverage of beautiful mountains. Thanks for sharing. I can't wait to visit my beautiful Pakistan. Another amazing write up with fabulous pictures! Awesome! Why dont you become a guide and help us expats travel these beautiful trails. It would be wonderful if there was some sort of travel organization to plan these travels. Excellent Work!!! Very inspiring. Keep it Up. It is an absolute pleasure reading your journeys. Thank you for sharing your moments with us. Brilliant as always! simply majestic, well done Imad. Lots of information with beautiful pictures. Super nice! Thanks for sharing. Proud of your work. Rugged Beauty. Mind blowing pictures. Congratulations on completing a tough trek. Beautiful pics. Thanks for the info. Great write up and photographs are absolute visual treat ! Keep it up Ímad ! How beautiful these places are! I also went on same trek this year, maybe upon your return but we did not pass Gondogoro la and returned from Concordia. I can totally relate to your experience and interestingly I am also living in Saudi. Hope to see you one to learn more from you. Very good drafted article and very informative. God bless you for bringing these marvelous pictures in my living room. Please take care in your future endeavors. Pakistan could be the best home away from home for foreign visitors. Zabardast... Really enjoyed reading. How many days took this journey? Wow! Stunning photos! Did not know such spectacular beauty existed in Pakistan! What a great article. Excellent post and pictures are gorgeous. it was very refreshing to watch these breathtakingly amazing pictures. The northern areas especially the majestic peaks, snow covered valleys and glaciers are refreshing. 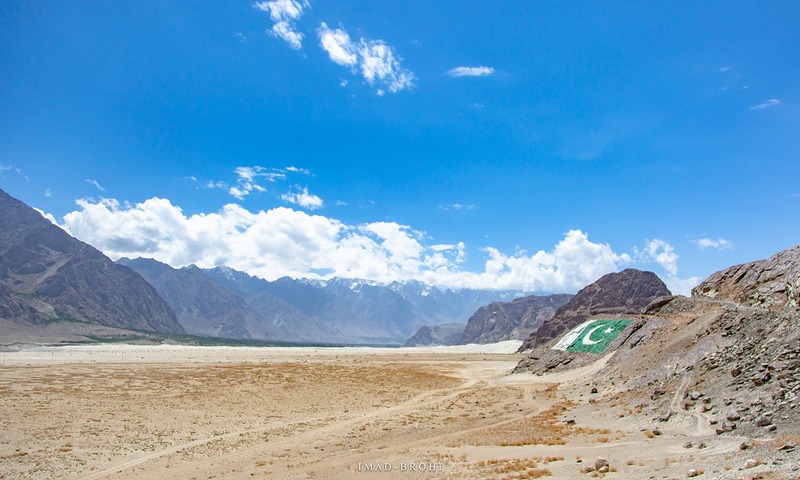 these valleys depicts the true colors of over beautiful country. 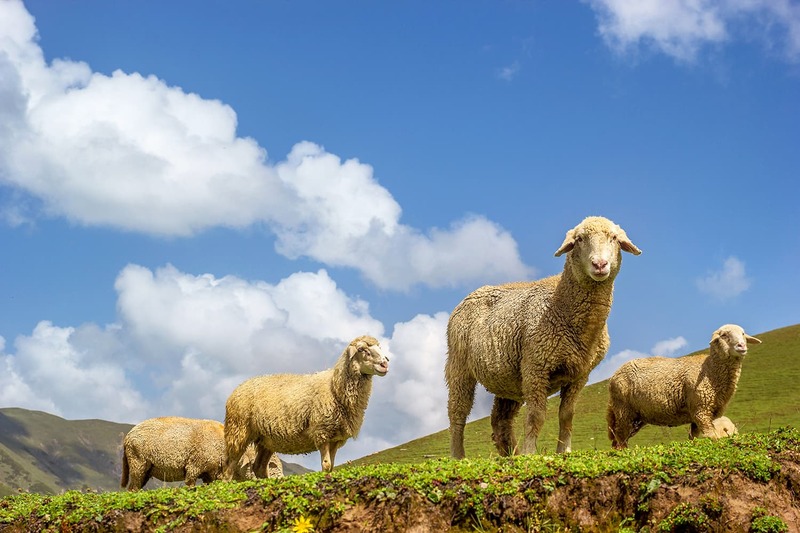 I would say that you have a real hobby and sitting on laptop reading this article I am really inspired rather pumped up to visit these areas which are very seldom explored by our citizens. Bro, credit goes to you that you have the urge to embark upon such difficult yet adventurous journeys. Keep it up. Amazing. Very inspiring and encouraging for others to explore the area. Thanks for sharing. Beautiful photographs. @Erik Jan Rijnders Skardu to Skardu was 13 days. All the best in your next trip to Karakorams. They are truly incredible. Let me know when you are coming. @javed Qamer Washington DC, there are many talented, local guides working in Pakistan. They know the area well and are well equipped to handle any situation on the mountain. Local tour operators arrange these guides. I do this as a hobby and have helped many expats and international teams plan their trips to Karakoram in Pakistan. Thanks to Dawn.com, this area has finally got some attention it deserves in the last few years. Dear Imad, Could you advise the cost of the trip for 2 persons! @Abdullah Skardu to Skardu round trip took 13 days. Add two more days for Islamabad. @Abdul Hanan Abro: the cost trip changes every year and depends on many other factors but should be somewhere between Rs. 100,000 to Rs. 200,000. I would advise you contact local expedition companies. There are many, just Google it and many will show up. You will have to ask several of them to get an idea on prices and services. Amazing Pictures, just shows how beautiful is Pakistan. I think you didn't share the picture of 4 8 thousanders from top of Gondogoro La, I have done the same trek back in 2014. An unfortunate incident happened during our trip while descending Gondogoro La, we lost our tour lead Waqas. Great job brother. very tough and beautiful journey. Positive image of Pakistan. This is such a remarkable insight to an area I will never be able to travel to now but these stunning images are truly fantastic thank you for sharing. outstanding and amazing. thank you for sharing. congrats on achieving this. Bite me. An I dreaming? What a fantsy-full journey. 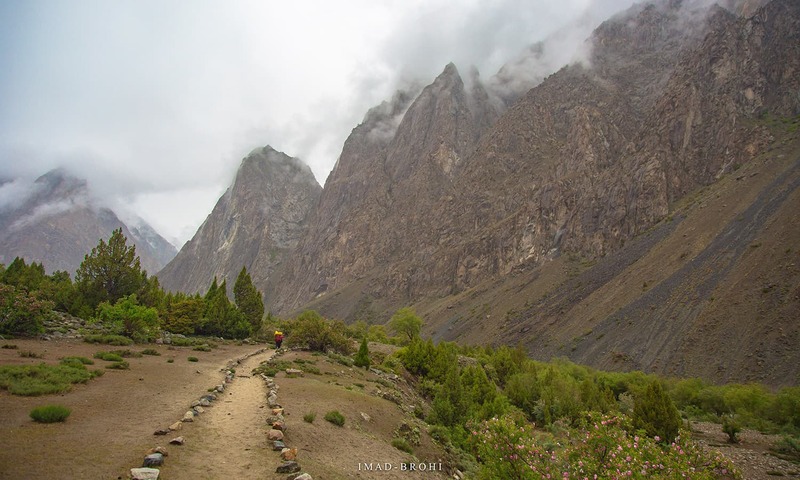 Loved the write up Imad - thanks for sharing your amazing trek! Simply beautiful, breathtaking & amazing views! May Allah SWT give you all the strength & courage to continue performing these great feats! You have made it possible for us & the rest of the world to view such delectable sites! Thank you. Thanks for sharing such a well written travelogue. It's descriptive and informative. I like the fact that you have also made sensible recommendations at the end and haven't romantiscied it to make the impossible possible. Very courageous journey and well-captured pics. Perhaps you can consider posting this on global trekking websites too, in order to create more awareness about Pak’s beautiful scenery and amazing climbing opportunities. Absolutely in love with every bit of your article... that’s what I call ‘Living it Up’!! Thank you Mr. Brohi to take me through a wonderful trekking trip. I hope to go for trekking with my sons in the near future, inshallah. Pakistan has so many beautiful treks in our northern areas than any other country on earth. Hopefully our new Pakistan will be more and more safe and accesible to go around. And help the local communities to develop like Austria, Switzerland and northern Italy. The new government of Pakistan should make a tourist minister to develop our tourist industry flourish. And mark the treks for the safety of trekkers. And develop necessary infrastructure. Wow. I am simply jealous. You have been to paradise. Wish I get time and chance too.